I was out doing a recording session with my Sony PCM-D50 yesterday, and as always I was making sure to keep an eye on the battery meter. I’ve never had a battery die unexpectedly in this recorder, but I was kind of wondering what would happen to a recording if I suddenly lost power. So today I decide to run a quick test. I started a recording, and instead of hitting stop to end it, I hit the power switch and watched my unit shut down. When I powered back up, the WAV file was intact. It stopped at the moment when I turned off the recorder. Now theoretically, if your batteries fall out (unlikely given the sturdy battery casing) or if your batteries suddenly die, this might not work, since the unit could lack the power necessary to close off a recording. But I’m almost as confident that I won’t lose recordings using a PCM-D50 as I would be using a DAT or cassette recorder. 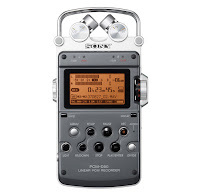 Most other low end digital recorders (including minidisc recorders), need to take a few seconds to save a file after you’re finished recording. Otherwise the data is not written permanently to the disk and you could lose data if your battery is removed or your unit is abruptly turned off. You can just refer to me as Brad Linder and provide a link to this blog.